On July 8, 2014, just after sunrise, 28-year-old Lars Mittank arrived at an airport in Bulgaria to catch his flight home to Germany. He stepped out of a taxi, picked up his bags and walked into the departures hall. Then, in a flash, he ran out of the terminal, without his luggage, as if someone, or something, were chasing him. He looked frightened, paranoid and possessed. He stopped at the main entrance for a brief second before he ran across the parking lot, climbed over an 8-foot barbed-wire fence and disappeared into the woods and into the blank. It was the final moments of Mittank’s vacation, the first time he’d been abroad. Mittank and his friends, five former schoolmates, all in their late 20s, had spent the previous week in Varna, a beach resort that sprawls along Bulgaria’s Black Sea Coast (aka the Bulgarian Riviera). But now, it was time to leave. Nothing else, however, struck them as odd. By all accounts, Mittank was just a regular guy. He was a football fan. 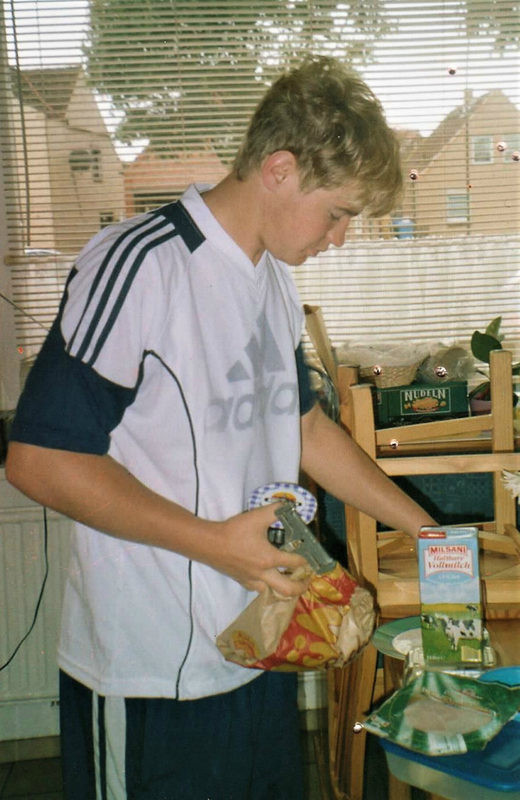 He supported his local team, Werder Bremen, the “Green-Whites.” He wore Adidas T-shirts and scruffy sneakers. He had plenty of friends, a girlfriend and a decent job at a local power plant. He always visited his parents. In fact, after his dad’s stroke, he’d help out around the house after work. Essentially, there was nothing unusual about him. But after the group checked out of their hotel at noon, Mittank made an announcement — he’d changed his travel plans. He’d gone to the hospital earlier that morning. A couple of days before, he’d ruptured his eardrum during a night out. A change in cabin air pressure could’ve made it worse, so he had to stay put for a bit — doctor’s orders. It was no big deal, though, just a temporary setback. He’d been prescribed antibiotics (something called Cefuroxime 500), and he could fly home the following day. He told his friends to go on without him. He said he’d be alright. Mittank, however, needed a place to crash in the meantime. The problem was it was high season, and nearly every room in nearly every hotel was occupied. Eventually, he did find one place with vacancies — Hotel Color. An added bonus: The rooms were cheap, and it was close to the airport. It was around this time, though, that his behavior changed. He called his mom from his room. He was whispering, acting strangely. He told her to cancel his bank cards. He said he was being followed. He was looking for a place to hide. Then he hung up. “Why did he text me about those tablets?” Sandra asked, again on German TV. After Mittank disappeared, the police checked the hotel’s security cameras. They found him pacing up and down the foyer, looking out the window, hiding in the elevator. At 1 a.m., he left the hotel for an hour, before returning to his room. No one knows where he went. Mittank’s wallet, cell phone and passport were still in his backpack. All he had were the clothes on his body: a yellow T-shirt, jean shorts and white sneakers. The fight took place in a McDonald’s, after a boozy all-nighter. It was between him and a group of other German tourists. It was over football. He was a Bremen fan; they supported rival team Bayern Munich. He stood no chance. It was four against one, and his friends were back at the hotel. “Perhaps that fight stressed him out, and it triggered something in him,” Sandra has theorized, while emphasizing that Mittank had no history of mental illness. The medication seems blameless, too. “He didn’t take those antibiotics. He didn’t even fill out his prescription,” Kostov remembers. “So his behavior couldn’t have been a result of that. I can’t think of a single reason why he left my office in such a panic. I’m still confused. A week passed, then another and another. Mittank had been missing for almost a month. Sandra hired a local private investigator, Andreas Gütig, who jumped on the case. He watched the airport video over and over again. (Perhaps the police missed something, but they hadn’t.) He contacted hospitals and homeless shelters. (Perhaps without identification, Mittank was simply a John Doe in some Bulgarian ER, but he wasn’t.) Gütig traveled to Varna and handed out missing-person flyers: Have you seen this man? Five-foot-9, 180 pounds, average build. No one, however, recognized his blonde hair, brown eyes or wide nose. Maybe Mittank started over. But there was no reason for him not to go home. He was close with his parents. He wouldn’t have done that to them. “He was my only child, so we had a special bond,” Sandra has said. Mittank was the outdoors type. He knew how to hunt, fish and trap. So could he have survived the elements? “Varna gets really hot in the summer [temperatures reach the mid-90s], and without a water source, it’s pretty much impossible to stay alive,” a local tells me. “There’s a big river near the airport, but that leaves food and shelter. If he tried to survive in the woods, he died there. He might have found an abandoned cabin somewhere, but there isn’t much to eat in the wilderness.” The police searched the area with drones, then cadaver dogs. But they found nothing. In December 2016, it looked like there was a break in the case. Police in Porto Velho, Brazil, found a man walking along the highway, barefoot. He was disorientated, confused. His clothes were rumpled. He had no identification, no past. He didn’t know who he was. A photo of him, laying on a hospital bed, circulated on social media. He looked just like Mittank: same height, same build. Everything was dead-on. Could it be? In the comment sections, speculation swirls. “He planned his disappearance. I would bet money on it,” one person writes. “He swallowed drugs and freaked out because he was scared of getting caught. He later died from an overdose,” theorizes another.